Spruce - "Queen" of the forest, leading the ratingpopularity among the masters of landscape art. This sacred tree, talisman projecting portion and a powerful source of bioenergy, valued not only for its unique healing properties, but unusual decorative. Needle emerald foliage, dark green and even blue shades able to transform the vegetable composition, giving the unique flavor landscaping area. Few can remain indifferent to the luxurycolors and beauty of the frozen needles conifers. No wonder that in spruce planting site is used quite often. 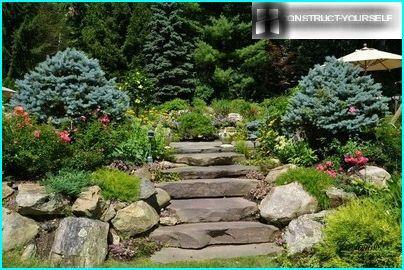 She looks great in a container plantings to frame the garden paths and design of rocky gardens. Trees with needle-like leaves of rich greeninteresting shade look, combined with bright flowers, annual and perennial plants. perfectly suited to create tracks: Japanese anemone, pansy, Aquilegia, phlox and hosts. Softwood - the ideal basis for creating evergreen sculptures, capable of making an external view of the garden is richer and more colorful. Ephedra will delight saturation needle green shades in the summer, will not burn in the sun, and winter, contrasting with the white snow. The allocated volatile plant can efficiently clean the air, putting on the human health-improving effect. 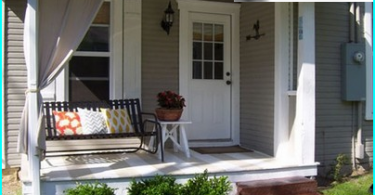 Spruce is perfect for any style of landscape design. Fluffy branch convenient to use in the manufacture of craft: creating paintings, herbaria, Christmas songs. However, spruce, like any other plant which haslimitations. For example, this ephedra is able to grow strongly, dimming area and depleting the soil. 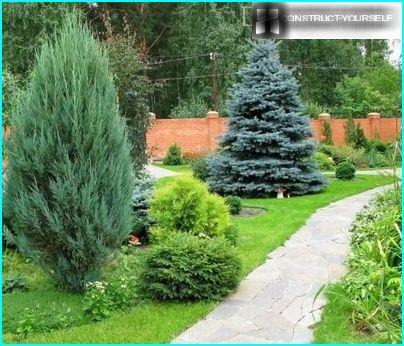 Therefore, to design gardens used types of spruces, with a dwarf form. It is advisable to plant spruce along the fence. In a short span of time ephedra increases curvy shape, and his thick legs form a continuous and dense wall. In modern parks and gardens more than 20 species of spruce. Main when choosing a type of ephedra is its crown configuration and size of plants as an adult. 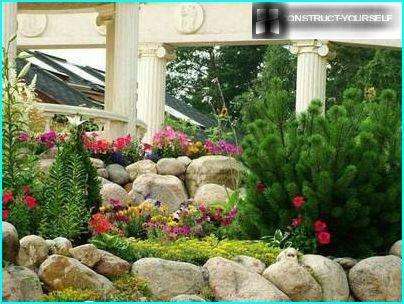 Common - The standard form presented more than 50 gardenforms. Created on the basis of its low-growing form reaches a height of 1.2 m, and sredneroslye - 3 meters or more. 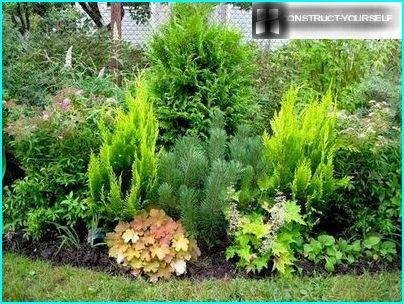 Wide needle color palette ranging from the golden and ending rich-green, the branches collected in pyramidal crown or pillow, conifers make this kind of welcome on the garden plots. Prickly - In the culture are more than 70 varieties. Most of them medium and tall trees up to 40 meters high with a beautiful cone-shaped crown. Although there are also dwarf forms up to 2 m very prickly needles:. Hence the name of the form. It may be bluish-white, blue-steel, silver, and blue-green. Mew - Has more than 20 decorative forms. The name of the form was due to ash-gray color of the bark and needles sizomu shade. Dwarf forms of this kind have a spherical shape and gnezdovidnuyu crown and tall - conical. Needle color palette is quite wide ranging from yellowish-golden and blue-gray and ending with a bright green. Eli, like any plant, divided into three groups: dwarf, medium and tall. 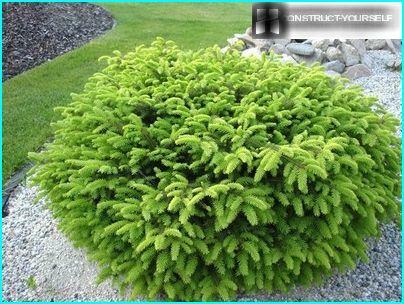 When planting gardens most popular dwarf conifers and sredneroslye representatives. Among the forms are stunted plants,dimensions in an adult several times less in comparison with the original parent species. For example, under natural conditions, spruce, named as Picea abies is a 50-foot beauty with a neatly decorated crown, the width of which reaches 8-10 meters. Decorative form of the tall ephedra known as Picea abies «Nidiformis» fir or "cushion", reaches up to two meters in height with a width equal to the crown of 2-3 meters. 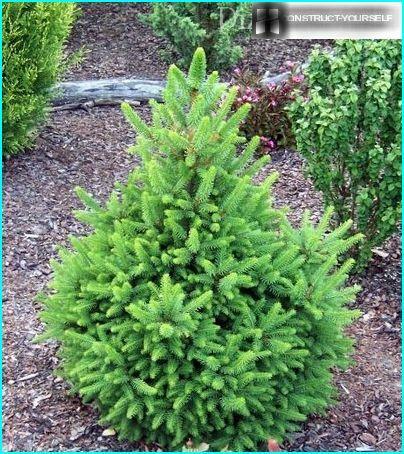 Among the modern varieties that are based on Norway spruce, the most famous decorative conifers, which have a crown gnezdovidnuyu or spherical shape. 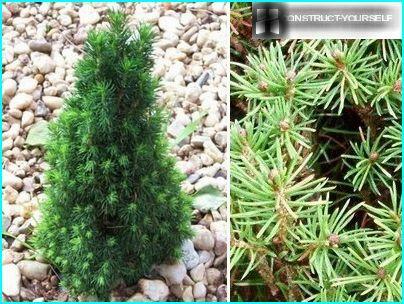 miniature shrub Picea abies «Nidiformis» perfectly suitable for the formation of a low curb and registration of rocky gardens. Located fan-shaped thin graceful shoots "Nidiformis" decorates mild and short needles delicate emerald hue. No less attractive and "Little Gems". The off-shoots from the middle of the crown, framed by dark green needles thin, neat hemispherical form "cushion". 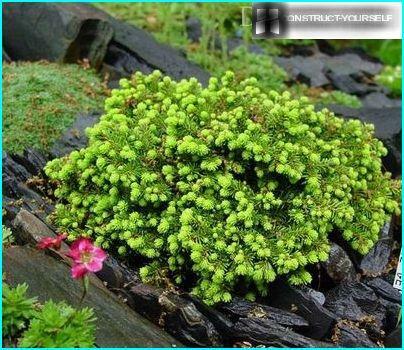 Particularly interesting it looks as shtambovoy form, planted in a pot or container floor. Beautiful uzkokonicheskuyu thick crown shape hasPicea abies «Will's Zwerg». The plant is interesting because of covering dairy shoots pale green tint young needles, which contrasts favorably against the dark green of old needles. 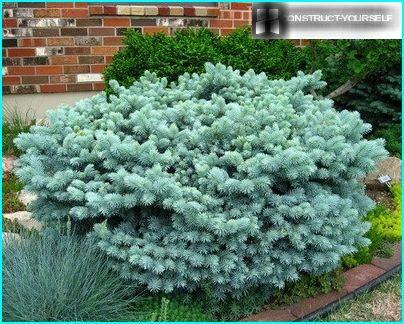 Evergreen shrub well-suited for small home gardens. Unusual decorative famous deducedbreeding by "Globoza glaucoma." Bonsai plant has no explicit trunk. Its spreading branches dotted with millions of fine needles of elegant silver-blue hue, form a beautiful spherical crown. The resulting bumps on the branches that resemble Christmas decorations, give the tree a special appeal. You can not ignore the picturesquely sprawling onland undersized grade. Miniature «Nana» resembles a soft pillow, and «Echiniformis» is identified with koloboks, round shapes which are the original frame garden paths. Most species of fir trees themselves are shade-tolerant, but often their dwarf forms are very sensitive to lack of light. 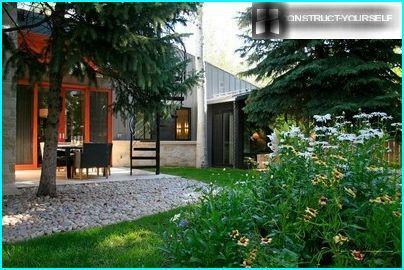 When you create a backyard design is accepted assredneroslye use conifers, which reach heights of 15 meters or less. A low-rise single tree with a clearly defined crown beautifully looks on a background of grass "carpet" or the walls of the house. To add a picture to help spectacular snag or white stone. 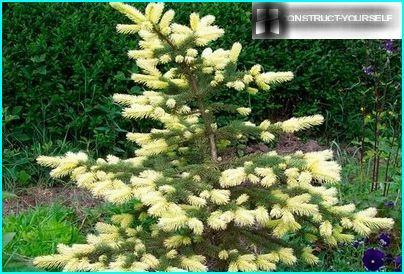 Blue spruce - one of the most popular types ofEphedra, revered designers, not only for the simplicity of care, but also a fascinating change of colors needle foliage throughout the year. Only 20% of representatives of this species have a distinct color of the sky, the other rich in green and bluish tones. Blue beauty is not able to withstandfluctuations in temperature of the northern regions and feel comfortable only in the temperate latitudes. Spruce needles with blue advantageous to look along the garden paths, on the background of wooden buildings and stone buildings. 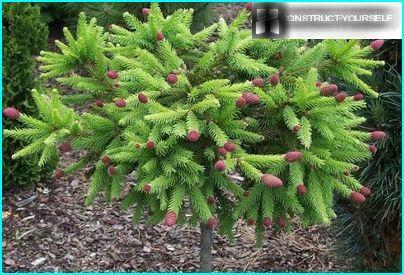 Bright representative of this type of acts Picea pungens «Blue Diamond», which translated means "blue diamond". Variety of collections to help weeping spruce species. Given their tendency to the aquatic environment, conifers you can safely use when placing the shores of reservoirs. 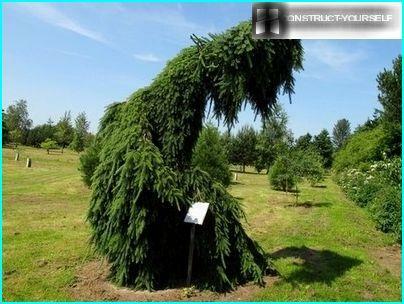 Full-size trees weeping spruce reach a height of 10-15 meters and a width of 2-3 meters. Thin branches sveshivayas, twisted round the trunk of the plant, giving it a weeping form. More adapted to our climate, Canadianspruce. Konica famous frost resistance and ruggedness to maintain. It is interesting for the landscape design that has a decorative tapered crown for the year gives a small gain, and blends harmoniously into the design of even very small areas. Against the background of monochromatic green "sisters" stands out advantageously Picea pungens «Maigold», to complete your collection of high-quality beauties in 1988. It will look great as a tapeworm. Crohn wood, reaching a height of 6 m, isloose pyramidal shape. Creamy-yellow needles on young shoots in a few weeks gradually changes color, getting no less attractive bluish-green tint. If you allow the site area, then to create a beautiful and original images better use eating different species and varieties. The composition should not be too colorful. 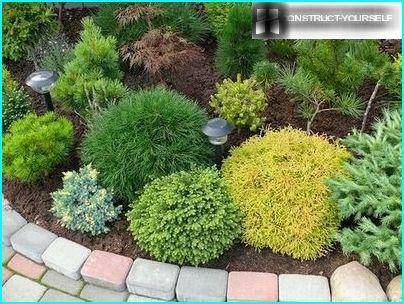 For groups of three conifers, use two color schemes. In preparing the composition of the five evergreen plants engage in all three colors. Forming a layered composition comprising 20-30 plants, place the elements of the groups, picking them by color. Christmas-tree-shrub ensemble requires competent placed accents: the foreground is occupied low-growing plants, rear - sredneroslye conifers. Avoid feeling density Christmas tree plantations will help improvement in near-wellbore region conifers normal or Moorish lawn. Juicy needles dark shades emphasize the beautyLocated next to a flowering bush. In addition to flowering plants a good addition to the beauty of coniferous shrubs become unusually colored foliage: Weigel, mock orange, barberry. Proper planting and care - a guarantee that the pine beauty will please its presentable appearance all year round. planting time. Ephedra is best planted in early spring or inearly autumn, when the plant is not yet or has already passed phase of strong growth. 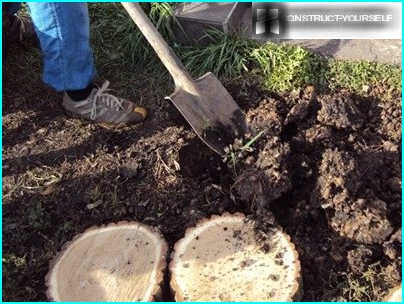 To keep the young shoots from frost and rodents, near-wellbore area for the winter, it is desirable to mulch with peat. Placement. In natural conditions, spruce grows well inValley, where getting enough water to supply a strong root system. But at the same time, she does not like swampy area and therefore needs a drainage arrangement. The composition of the soil. All kinds of firs love fertile alkaline and acidicsoil. Intolerant them to heavy soil types. When landing ephedra in depleted soil planting hole is pre-enriched by introducing 100 grams of complex mineral fertilizers. 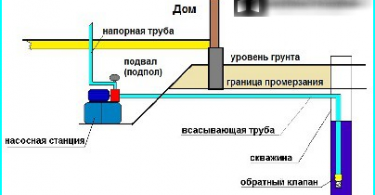 With a lack of oxygen and power plant may even die. It should be borne in mind that strongly affects the firsurrounding flowers and shrubs, so it is better to place a short distance from the sun-loving plants. Do not plant conifers close to each other, because its branches they will restrict access to sunlight. By following these simple rules when selecting varietiesand the preparation of herbal formulations, you can create on your site a cozy and beautiful design that will delight the eye throughout the year.